The little bug that causes a lot of harm. It’s chinch bug season and truthfully, there is nothing to be excited about here. With the abnormally warm winter we had, it is likely that these pests are larger in number than usual. If these little guys get free reign they can devastate a yard within days. While chinch bugs most commonly affect St. Augustine lawns, they have been known to cause destruction in Bermuda and Zoysia yards as well. Appearance: Chinch bugs are very small insects with six legs that only grow to about one-fifth of an inch long. When matured, they have black bodies that are covered with frosty white wings folded over their backs. Up close picture of the lifecycle of chinch bugs. The name chinch bug is derived from the Spanish word chinche. This word has come to mean “pest” and is used in many phrases such as tener de chinches la sangre, meaning tiresome or troublesome. Lifecycle: In early spring, once temperatures reach 70° F, chinch bugs mate. Females lay up to 500 eggs on grass leaves, stems, roots or in other protected crevices over a period of two to three weeks. 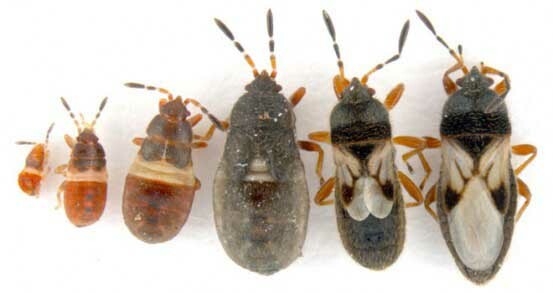 Each year we can experience up to four generations of chinch bugs. Damage: In a short amount of time, chinch bugs can destroy large swaths of your lawn. They damage lawns by inserting their beaklike mouth into leaf blades and sucking out the moisture and nutrients, while also adding toxins back into plants. Grass leaf blades will turn yellow on the edges and then brown out in large patches. Chinch bugs love the heat so they tend to start by damaging the parts of lawns closer to hardscape such as driveways, curbs, sidewalks or along the foundation … anywhere it’s very warm. Identification: Due to their diminutive size, you may not even know you have an infestation until the damage is already done. The best place to look for these insects are on the stems of your grass, near the soil surface. After you sit and watch closely, you’ll be able to spot them crawling around. Chinch bug damage. 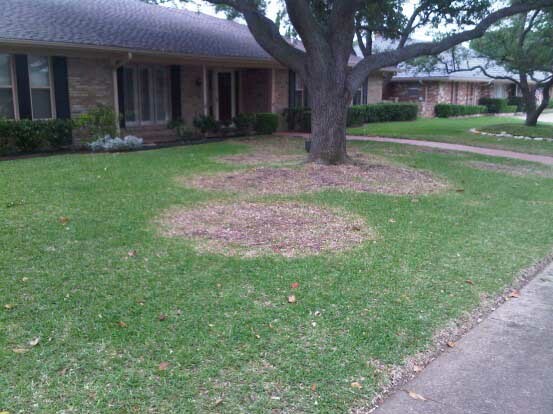 If your yard has circular patches such as these above, seek help! Beware of irrigation problems! Since we haven't gotten much rain in the last two weeks and the temperatures have been on a consistant rise, it is definitely time to set the sprinkler system to twice a week. If you are watering consitantly and don't see any signs of chinch bugs, do an irrigation audit to make sure that every part of the lawn is getting proper coverage. As with any pest prevention practice, a healthy, robust lawn grown in nutrient rich soil is your best defense against most pests and diseases. Insects are opportunistic and will cull weak plants first. Because chinch bugs thrive on excess moisture, be careful not to overwater your lawn. Regular fertilization and soil feedings will help to keep soil biology healthy and beneficial predatory insect populations active.